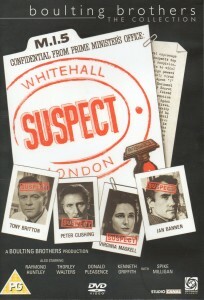 Cast: Tony Britton, Virginia Maskell, Peter Cushing, Ian Bannen, Donald Pleasence, etc. Background: The film was shot in just seventeen days on a very low budget (rumoured to have been in the region of £25,000) as an experiment by the Boulting brothers in raising the quality of the second feature. Verdict: This is a quietly effective film. Unsurprisingly given its genesis it is nothing special to look at but it follows the book on which it was based (A Sort of Traitors) quite closely and it accurately captures the post-war flavour of the novel. The acting is excellent: Virginia Maskell is superb as Lucy; Peter Cushing makes an ideal Professor Sewell; Ian Bannen is powerful and compelling as Lucy’s crippled boyfriend; and there are good performances from Donald Pleasence, Thorley Walters and Raymond Huntley in the lesser roles. The main problem with the film is its conclusion. In lieu of one of Balchin’s characteristically unresolved endings, we have instead an unconvincing punch-up that resembles something from a bad 1960s TV drama. Despite this flaw, and one or two attempts at humour that fall flat, this is a very fair attempt to bring Balchin’s world to the big screen.